Twenty-two states and the District of Columbia are suing to try to block the Trump administration from enforcing a new rule that would shift millions in Title X family planning funding away from Planned Parenthood and to faith-based clinics. The new ruled was announced in February by the Department of Health and Human Services to prohibit clinics funded by the Title X Family Planning Program from performing, promoting or referring for abortion as a method of family planning. The rule would require abortion clinics to choose between performing abortions or getting Title X dollars and moving abortion services off-site. Abortion rights advocates have claimed that the policy amounts to a “gag rule” and multiple lawsuits have been filed against the rule. Included as plaintiffs in the lawsuits are nearly half of state governments. One lawsuit filed by Planned Parenthood Federation of America and the American Medical Association claims the new rule will create a “national public health crisis in short order.” The organizations claim that the rule will only increase the number of abortions and “riskier” pregnancies. California filed its own lawsuit, while 21 other states led by Oregon have joined a similar lawsuit. Along with Washington, D.C., those states included in Oregon’s lawsuit are New York, Colorado, Connecticut, Delaware, Hawai’i, Illinois, Maryland, Massachusetts, Michigan, Minnesota, Nevada, New Jersey, New Mexico, North Carolina, Pennsylvania, Rhode Island, Vermont, Virginia, and Wisconsin. “The Final Rule would impose burdensome and unnecessary restrictions that would reduce access to care, interfere with the patient-provider relationship, and undermine Congress’s intent in enacting Title X of the Public Health Service Act nearly five decades ago,” the lawsuit claims. As The New York Times reports, Title X provides about $286 million in annual funding that have over the last several years gone to programs that provide services such as birth control. Planned Parenthood, the nation’s largest abortion provider, received about $60 million through the Title X program each year. The $60 million that Planned Parenthood could lose as a result of the rule change for Title X comes as The Planned Parenthood Federation of American and its affiliates already receive more than $500 million in government grants and reimbursements every year. Planned Parenthood and its affiliates perform over 300,000 abortions ever year in the U.S.
Christian conservatives and others have long called for Planned Parenthood to be stripped of its taxpayer funding. Taxpayer funding of abortion is outlawed by the Hyde Amendment. 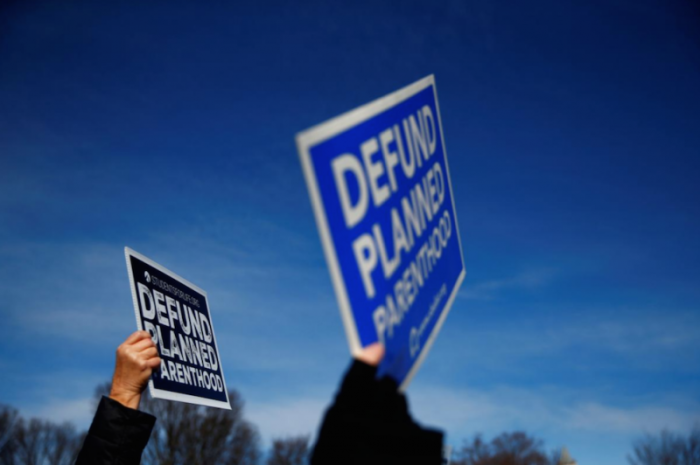 Even though Planned Parenthood has claimed that the money they receive from taxpayers is not used for abortions, critics insist that money is fungible and that the federal funding helps indirectly subsidize abortion. The introduction of the HSS final rule was praised by evangelicals and social conservatives. “The finalized ‘protect life rule’ draws a bright line between abortion and family planning programs — just as the federal law requires and the Supreme Court has upheld,” Family Research Council President Tony Perkins said in a statement last month.